Annawadi is a makeshift settlement in the shadow of luxury hotels near the Mumbai airport, and as India starts to prosper, Annawadians are electric with hope. Abdul, a reflective and enterprising Muslim teenager, sees "a fortune beyond counting" in the recyclable garbage that richer people throw away. Asha, a woman of formidable wit and deep scars from a childhood in rural poverty, has identified an alternate route to the middle class: political corruption. With a little luck, her sensitive, beautiful daughter - Annawadi's "most-everything girl" - will soon become its first female college graduate. And even the poorest Annawadians, like Kalu, a fifteen-year-old scrap-metal thief, believe themselves inching closer to the good lives and good times they call "the full enjoy." Let it keep, the moment when Officer Fish Lips met Abdul in the police station. Rewind, see Abdul running backward, away from the station and the airport, shirt buttons opening as he flies back toward his home. See the flames engulfing a disabled woman in a pink- flowered tunic shrink to nothing but a matchbook on the floor. See Fatima minutes earlier, dancing on crutches to a raucous love song, her delicate features unscathed. Keep rewinding, back seven more months, and stop at an ordinary day in January 2008. It was about as hopeful a season as there had ever been in the years since a bitty slum popped up in the biggest city of a country that holds one-third of the planet's poor. A country dizzy now with development and circulating money. Barbara Ehrenreich calls Behind the Beautiful Forevers "one of the most powerful indictments of economic inequality I've ever read." Yet the book shows the world of the Indian rich - lavish Bollywood parties, an increasingly glamorous new airport - almost exclusively through the eyes of the Annawadians. Are they resentful? Are they envious? How does the wealth that surrounds the slumdwellers shape their own expectations and hopes? Some books carry me along, this one pulled. It was not easy to read, yet not easily put down. Poverty, corruption, racism, economic envy, and brutal indifference toward human life pummel the inhabitants of Annawadi, Mumbai's undercity, yet amazingly, there exist pockets of hope and aspiration. I have been inspired by this book (Karen J). There have been few books in my life that have stayed with me long after reading them - for instance, To Kill a Mockingbird and Angela's Ashes - and now I will add Behind the Beautiful Forevers to the list (Anne B). (Reviewed by BookBrowse First Impression Reviewers). The most riveting Indian story since Slumdog Millionaire - except hers is true. [An] exquisitely accomplished first book. Novelists dream of defining characters this swiftly and beautifully, but Ms. Boo is not a novelist. She is one of those rare, deep-digging journalists who can make truth surpass fiction, a documentarian with a superb sense of human drama. She makes it very easy to forget that this book is the work of a reporter... Comparison to Dickens is not unwarranted. A jaw-dropping achievement, an instant classic of narrative nonfiction… With a cinematic intensity… Boo transcends and subverts every cliché, cynical or earnest, that we harbor about Indian destitution and gazes directly into the hearts, hopes, and human promise of vibrant people whom you'll not soon forget. Riveting, fearlessly reported… [Beautiful Forevers] plays out like a swift, richly plotted novel. That's partly because Boo writes so damn well. But it's also because over the course of three years in India she got extraordinary access to the lives and minds of the Annawadi slum, a settlement nestled jarringly close to a shiny international airport and a row of luxury hotels. Grade: A. A tough-minded, inspiring, and irresistible book… Boo's extraordinary achievement is twofold. She shows us how people in the most desperate circumstances can find the resilience to hang on to their humanity. Just as importantly, she makes us care. A shocking - and riveting - portrait of life in modern India. …This is one stunning piece of narrative nonfiction… Boo's prose is electric. An unforgettable true story, meticulously researched with unblinking honesty… Pure, astonishing reportage with as unbiased a lens as possible. Starred Review. The best book yet written on India in the throes of a brutal transition. Starred Review. Deeply researched and brilliantly written... Boo's rigorous inquiry and transcendent prose leave an indelible impression of human beings behind the shibboleths of the New India. It might surprise you how completely enjoyable this book is, as rich and beautifully written as a novel. In the hierarchy of long form reporting, Katherine Boo is right up there. I couldn't put Behind the Beautiful Forevers down even when I wanted to - when the misery, abuse and filth that Boo so elegantly and understatedly describes became almost overwhelming. Her book, situated in a slum on the edge of Mumbai's international airport, is one of the most powerful indictments of economic inequality I've ever read. If Bollywood ever decides to do its own version of The Wire, this would be it. Without question the best book yet written on contemporary India. Also, the best work of narrative nonfiction I've read in twenty-five years. A beautiful account, told through real-life stories, of the sorrows and joys, the anxieties and stamina, in the lives of the precarious and powerless in urban India whom a booming country has failed to absorb and integrate. A brilliant book that simultaneously informs, agitates, angers, inspires, and instigates. 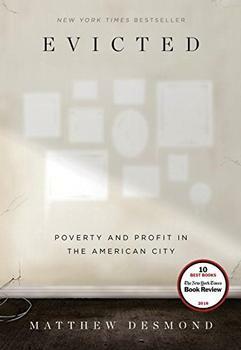 There is a lot to like about this book: the prodigious research that it is built on, distilled so expertly that we hardly notice how much we are being taught; the graceful and vivid prose that never calls attention to itself; and above all, the true and moving renderings of the people of the Mumbai slum called Annawadi. Garbage pickers and petty thieves, victims of gruesome injustice - Ms. Boo draws us into their lives, and they do not let us go. This is a superb book. I consider this book to be the best of 2012! It is that good. Interesting, intriguing, this book grabs you and holds on to you until the last page. I cannot recommend this book enough! 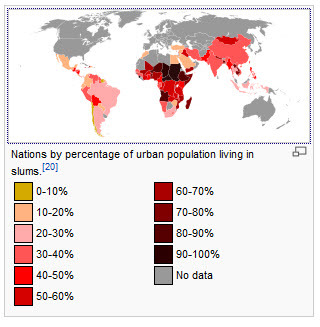 According to the UN, the percentage of urban dwellers living in slums dropped 10% to 37% in the 15 years leading up to 2005. But before you break out into celebration, there's just one tiny catch - because of the rising population, the total number of people living in slums has actually increased substantially, and is expected to continue to rise from about one billion today to about two billion by 2030.